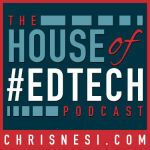 We're crossing over with the Google Teacher Tribe Podcast! (1:30) Intro - HOET and GTT Crossover! (6:21) Featured Content - Matt Miller and Kasey Bell from the Google Teacher Tribe Podcast join me for a very Google conversation!